The number of “Khmericans” being sent back to their homeland is on the rise. Meet one young man yearning for the old days in Lowell, Massachusetts, but committed to starting over. SOKHA CHHIM rarely heads to work without a black Red Sox cap propped on his head. He makes sure his Nikes stay flashy and white, that the legs of his baggy jeans drape at just the right angle. Sometimes he’ll don a royal blue jersey featuring Tom Brady’s No. 12. But in a concession to his new homeland, Chhim hangs a black and gray scarf called a krama around his neck instead of the gangster chain he wore on the streets of Lowell. Chhim is an outcast, one of 30 or so Cambodian-Americans lawbreakers from Massachusetts sent back to Cambodia in the last 10 years. He was deported to Phnom Penh in May 2011 after violating probation in the shooting of a rival drug dealer, arriving penniless and unwanted. 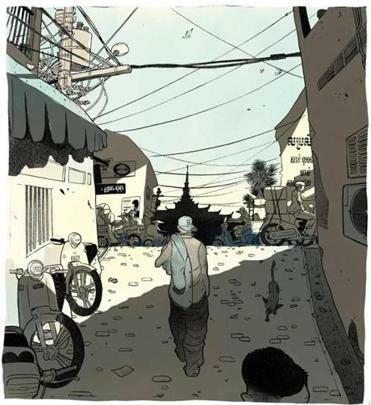 He speaks broken Khmer, has no family to lean on, and needs a map to navigate this zigzagging city of nearly 2 million. Yet he is putting down roots in native soil he never knew. And unlike most exiled “Khmericans,” who seethe over their loss of American residency, he is finding his own redemption. As federal officials broaden efforts nationwide to seize and deport immigrants with criminal records, the streets of Phnom Penh will inevitably see more Massachusetts exiles like Chhim. Some 600 Cambodian-Americans, virtually all of them male and a majority convicted criminals, have been shipped to Asia’s most traumatized nation since 2002, when Cambodia signed a repatriation agreement with the United States. Federal data show that deportations averaged 41 per year from 2001 through 2010, only to leap to 97 in 2011 and 93 last year. “People are getting picked up left and right,” says June Beack, a lawyer at Neighborhood Legal Services in Lynn who has defended Cambodian-Americans facing deportation. Cambodians have long posed a deportation dilemma for the United States. Brought here as victims of the Vietnam War and the Killing Fields of the Khmer Rouge, most were dropped into ghettos in Lowell, Lynn, and Long Beach, California, and left to overcome cultural and language barriers with little support from the government that took them in. While illiterate adults fell into low-pay work, their children stumbled through crowded public schools or took to the streets in violent gangs. Many of those eventually deported had become hardened felons, but others were exiled for first-time misdemeanors like shoplifting or check fraud. A major reason for their expulsion is that they never obtained citizenship, an option open to them as war refugees. Chhim was in that category, and the result of his blunder was a one-way trip to an unknown land. CHHIM STARTED LIFE as a lucky survivor of the murderous revolutionaries known as the Khmer Rouge. He was born in 1981 in a refugee camp on the Thai-Cambodian border, where he contracted a bacterial infection. Chhim’s mother, who remained in Cambodia, asked his aunt and uncle to take the ailing baby to Western Massachusetts, where they were being sponsored by a local couple. “I guess I was a cute baby, but I was sickly,” he says. As he came of age in Amherst, Chhim built up a resentment toward the endless list of responsibilities that came with being the sole English speaker in his home. “I felt like the whole world was on my back,” he recalls. “I got tired of always waiting for the cable guy.” He began skipping school, getting into fights, and smoking marijuana. His first run-in with the law was at age 14, when he spent a night in jail for driving a stolen vehicle. He soon quit school and moved to Lowell on his own to find work. “Lowell was just worse,” he says. “Everybody around you was drug dealers, gangbangers.” Chhim joined up, eager to make money for that “new pair of Jordans,” he says. 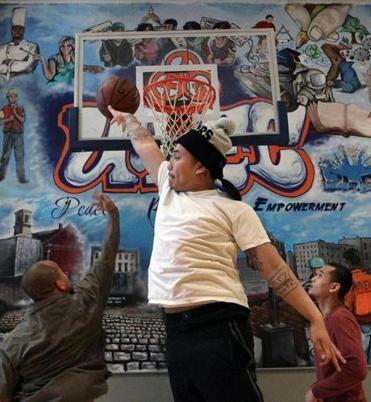 At programs like the United Teen Equality Center in Lowell, (participant Johnny Chheng is shown here), organizers hope to turn around the lives of young Cambodian Americans and others. It was also when he decided he could turn his life around. He obtained his GED in prison and took anger management and resume-writing courses. Prison “taught me how to grow up,” he says. Still, after serving nine years and four months, Chhim failed to transition to the clean life he imagined and began violating probation. Fearing the inevitable deportation, he began a year underground. “It was just keep running and trying to survive,” he says. Chhim knew only horror stories of his homeland: a quarter of the population diseased, starved, or put to death by the Khmer Rouge; a life of tilling fields from dusk till dawn; a sweltering climate and authoritarian system in which the privileged crush and exploit the impoverished. And worse. “Everybody heard stories about Cambodian jails,” he says. THAT POTENTIAL IS SOMETHING the Rev. Bill Herod has been trying to unlock for years. An Indiana minister who has lived in Cambodia since 1994, he started the Returnee Integration Support Center in Phnom Penh in 2002 to help deportees like Chhim obtain documents, housing, jobs, and drug treatment. He knows of 12 returnees who have died, several from suicide or drug overdoses. Another 17 are in prison. Some arrive without the medical paperwork required under the US-Cambodia repatriation agreement, which Herod believes is crucial for their physical and emotional well-being. All are left to fend for themselves. “Most do not transition easily into Cambodian life,” says Herod. He lost an eye when drain cleaner splashed into his face as he tried to tear the poison from the hands of a suicidal returnee. “Most have strong resistance to the country, the people, the food, the society, the traditions, the language,” he says. Those who succeed must choose not to give up. United Teen Equality Center employees Sakieth “Sako” Long, left, and Siborak “Eric” Ponn take a break. Opened in 1999 and serving 1,000 teens a year, a third of them Cambodian, the center is a haven from gang violence and life on the fringes. Located in an old Methodist church, it offers training in the building trades, culinary classes, counseling, and GED preparation. Cambodian youths stop by after work or school to learn carpentry, play foosball, shoot baskets, and hone their music skills in a new recording studio, part of a recent 8,000-square-foot addition inaugurated by Governor Deval Patrick in mid-November. The center is a place of redemption for men like Sakieth “Sako” Long. A mentor and program leader at the center, the 33-year-old Long arrived in Lowell from Cambodia as a child and grew up with street gangsters for role models. He got into trouble with the law in the late 1990s, but a few years later connected with the center and got a job there. He has since focused on saving young Cambodian-Americans from crime, gangs, and a life of regret. “You can leave the gang life and be successful the hard blood-and-sweat way instead of hustling,’’ he says. But without people like Long to put them on the right path, many Cambodian-Americans lacking US citizenship end up back in a homeland they never knew. Nationwide, nearly 1,900 have final orders of removal, according to federal Immigration and Customs Enforcement officials, meaning they can be expelled at any time, while 669 are in deportation proceedings. The ones facing exile can look to Chhim, whose odyssey from Massachusetts to the Mekong has led to a paycheck and a budding hip-hop career. He hopes to try out for Cambodia’s national baseball team, and he released a mix tape titled “Take Over” in September. “It feels good to be appreciated for doing the right thing, and it took Cambodia to do that,” Chhim says. Under his musical moniker, Dolla, he pens melancholy lyrics like these: Can’t go back, go back, to a place that I call home. Exiled American is who I am, a one-way flight wasn’t part of the plan. Olesia Plokhii is an Ottawa-based journalist, and Tom Mashberg writes from Newton; they reported last year from Cambodia. Send comments to magazine@globe.com.